My friend is taking a pottery class. Last week she told me she’s enjoying it even while she wonders if she’s moving too slowly. At her last class, she formed a coil pot but hadn’t had time to get anything on the wheel. “But I figure I’d rather take home a few things I want instead of several I made in haste, ” she said. “Even though you’d have messy hands?” she asked. As soon as she asked, I could feel imaginary clay drying on my hands, its chalky film sucking the moisture off my palms. I noticed I was rubbing my fingers together, unconsciously seeking assurance that my skin was still there. It didn’t help, I suppose, that earlier that day I’d gone into mild convulsions when our black lab ran her slobbery tongue from my wrist to my elbow in unrestrained dog-joy at being alive. I concluded that as long as I had my hands in the clay, I would be fine. But then I’d need to wash up immediately. At the same moment, I had another, more surprising, realization: I half expected to enjoy the process. I’ve never found getting there to be half so much fun as having arrived. The process, it seems to me, is a necessary evil. In chapter eight of The Artist’s Way, Julia Cameron picks apart my preference for the destination over the journey. Instead of allowing ourselves a creative journey, we focus on the length of the trip. “It’s such a long way, ” we tell ourselves. It may be, but each day is just one more day with some motion in it, and that motion toward a goal is very enjoyable. My friend is coming for a visit in a few weeks. As if to test me and this tentative willingness to squeeze clay between my fingers for no better reason than how it feels, she offered to bring some along. If I know her at all, she will want to. And maybe then, I’ll close my eyes and push my hands into a sticky ball of clay and pretend it wasn’t Julia Cameron who said, Creativity occurs in the moment, and in the moment, we are timeless. We’re exploring Julia Cameron’s The Artist’s Way together. What do you prefer — the process or the outcome? What stood out to you in the chapters this week? Perhaps you’d share in the comments about your experience with Morning Pages, an Artist’s Date or any of the tasks you tried. For next week, we’ll conclude our discussion with the final three chapters. Give yourself the freedom to choose one chapter to focus on, and pick up the others at a later time. If you post about the book at your blog, please place your link in the comments so we can join you there, and feel free to use our Book Club button on your page. Photo by Daskar. Creative Commons, via Flickr. Post by LW Willingham. Buy a year of Every Day Poems, just $5.99— Read a poem a day, become a better poet. In June we’ll be exploring the theme Trees. Cameron’s on to something with the emphasis on process. The focus on product or destination can be paralyzing. Love your article, Glynn. Very inspiring. This chapter brought me repeatedly back to my days in the preschool classroom – my time with children and teachers – there was always the child who didn’t want to touch the clay, or feel the paint, or squeeze the play dough. Then there was the “George” who painted his own arm green while standing at the easel as I pretended not to notice… from the tips of his fingers all the way up to his armpit. We big people aren’t so different. We need space to explore when we are ready, and we need space to step back when we are not. Oh how I miss those days! If you were “one of mine” I would want you to know that you don’t HAVE to squeeze the clay, but do you want to – and I would want you to know that you are brave, whether you squeeze the clay or not. Donna, I can certainly relate with regard to sharing the work that you’ve written. For me, I feel that my work has to be perfect before sharing it. However, I realize that it will never be perfect as each time I look at a piece I’ve written, I see things I need to change. I’m working on this, though, and am taking baby steps in sharing little bits and pieces I call poetry, but even after I submit the work, I still see errors or things I could have changed. I guess you could still call that progress, right? By the way, I loved your poem. Grace, I am glad you are taking baby steps and … I definitely call it progress! I have also found that there is ALWAYS something to tweak… always. Did I catch a glimmer of “i’m not sure it really IS poetry” in your words? Poetry is like finger painting (but less sticky). Do you have a blog where I can see? I’d really love to read what you’ve written. Thank you for saying you liked my poem. It’s one of my favorites, and it cuts to the core of how I choose what I share because (and here comes something personal) about a week AFTER I wrote this poem (or before, I can’t remember) I wrote another – same meter, same style, same phrasing… it was not one that I shared though – it is, well let’s just say it’s not so cheerful. It was quite a while after writing them both that I realized that they seemed to be two pieces of the same poem!!! WHY did I break it up? This one was the light side… and Hmm… I need to spend some time with these two poems, twin poems of a sort, yet opposite. This one represents the healing to the other one’s pain – so the question is this: Why do I REALLY share one and hide one when actually there are pieces of the same one? Isn’t the wounding as important and valid as the healing? Oh well, now I have something to think about! 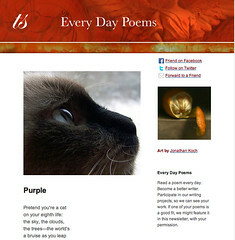 I have a blog (gracebrodhurstdavis.blogspot.com) where I have posted some of my poems, but that is a work in progress as well. Ahhh…. :O) I gotcha! Well, it’s all a work in progress, isn’t it? Even the done deals are capable of driving us crazy with tweaking if we look at them too long! That’s the beauty of this sort of thing… it keeps creating and being created! Thanks for the link… will check it out! I actually do really enjoy having my hands in the clay, though I don’t remember the last time I did. It might have been that head that blew up in the kiln. 😉 It’s the afterward – feeling the stuff on my hands. Love your approach to the little ones, and how that translates to grown-ups too. I love my lists, and the satisfaction of accomplishment. Why, sometimes I’ll add something to my list that I’ve already done just to cross it off! But as I’ve thought about process again this week, I am learning to enjoy portions of the journey. Helping students learn to make music on the piano has helped. Mastering a song IS PART of the journey, not the destination. While I anticipated the despondancy following our daughter’s wedding earlier this month, Julia helped me see that by living with a “destination” mind-set rather than a “journey” predisposes us to that crash! I’m not saying that the fairy-tale day the bride and groom had wasn’t worth the work, but the marriage is just beginning. Staying with “friends of friends” before getting the keys to an old, musty, mildew-y apartment, backing into a post & breaking the mirror on the passenger’s side: these are the things that make up the journey of a marriage. Some days, for short chunks of time, I actually enjoy the trip. But, if I were going to squeeze the clay, I’d need some rich hand lotion following the washing! Sheila, what a great example of how that process vs. destination plays out. I was thinking of you and Kenne when I had to keep using the P-word in this post, remembering some studies we did together and how we all seemed to despise the “process” concept so. But it seems it is a part of so much of life, being okay with just being in the middle of it, whatever it is. I love the quote about being timeless in the moment. Absolutely. I liked that quote too. As long as the feathers stay dry, we’re good to go. That is a wonderful picture. made alive on sticky skin. of doing what’s not done. Note: All words from the post have been twisted into this poem with permission. can’t even say why (which is probably part of why)! Wondering if I should buy some band aids? Sometimes a song says it all. Anyway – Martina McBride: http://www.youtube.com/watch?v=SE3S7VcyOPU When you listen you’ll know why I posted this here. Enjoy! And, do it anyway.